Pabbly Subscription is a complete solution for online businesses which handles the frenetic management work of billing and transactions. But it lacks in marketing the products of the merchants.So now Pabbly Subscriptions has an integrated affiliate management system which will help to grow the business of the merchants. The affiliate management system will handle all the frontend work, all you need is to set up the URL for affiliate partners and add commission rules for product and plans. The affiliate management system is located on the Pabbly Subscriptions dashboard. Let’s start learning about this system. When you click on the affiliate button then 5 options will be displayed in the drop-down section. These are the 5 basic required steps which you will need to manage the affiliate/referral commissions. In this section, you will be able to see the details of all your affiliate partners. Their email address, name, country, Country, Date and time are shown. The email addresses of these customers are also shown in the commission rules setup. You can make commission rules for individual affiliate partners. In this, you will add basic details for promoting your product. When you click on General Settings the system will first ask you to set up the client portal. Because you will get the affiliate signup URL after setting the client portal and your affiliate partner will get the promotional URL from the client portal only. First, you can see the affiliate sign up URL. You can add this URL to your website and get sign up for customers who want to become an affiliate. Second is “Cookie Lifetime” – Suppose any visitor comes to your website via a unique affiliate link but didn’t purchase anything. After some days the same visitor directly opens your website and complete the purchase. Then also the commission will be generated for the person whose affiliate link is used some days back. That means if you set 10 days as cookie lifetime and any visitor came to your website by the affiliate link then within 10 days if the same visitor completes the purchase then the commission will be added to the particular affiliate partner. The third option is “All Customer will be Affiliate” – It works the same as Client portal. You can decide whether all the customers who are purchasing your product can become your affiliate partner or not. First, you have to add the rule title. This title is added for avoiding any confusion in setting commission %. The best title you can add is your product name or plan name. Second, you have to add Rule Condition. From the first drop down you can select All affiliate or any particular affiliated partner you want to select. From second drop down you can either select all products or any particular product. And from third drop down you can select all plans or any particular plans. In this there is two option first is the commission for purchase and the second option is for the commission on recurring charge. With this, you can choose “Flat” or “Percentage” commission type also. Suppose you want to give 5% commission for first purchase then you will select percent from the drop-down section and add ‘5’ in the field. Finally, Save the Commission Rule. Once you save the commission rule it will be displayed something like this and you will have the option for deleting or editing the commission rules. You can add a title for the affiliate link and next paste the URL of your website or the page which you want to promote in the Target URL section. When you have added the target URL then all your affiliated partner will get a unique URL in their dashboard. Then just save the changes and you have completed the basic setup of the affiliate management system. Suppose any of your customer who only has the access of client portal or all your existing customer who do not have the access of the affiliate page of client portal dashboard. They can send you a request to join the affiliate program. 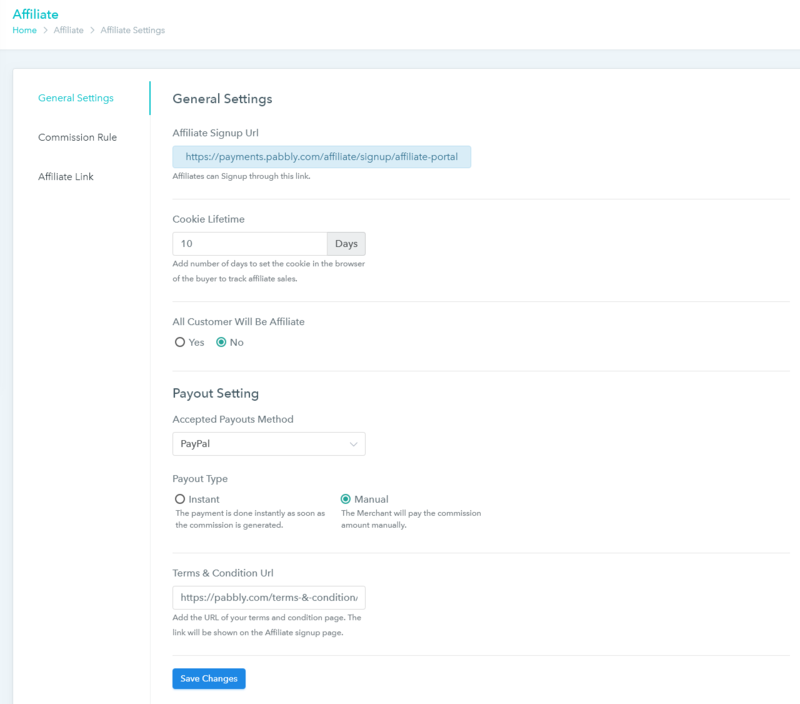 And in the Affiliate Request section of the merchant dashboard, you can see the details of the requested affiliate and you will also have the option to accept or deny the request. The most important one actually. In this section, you can see by which affiliate partner (Affiliate) link your product is purchased and the email Id of the person who has purchased your Product (User). Name of the product, Invoice number and Commission amount can also be seen in this section. Then you can see two blank sections “Is Paid” & “Payout Date”. This section will be automatically filled when you perform different actions. In the commission section, you will also find a drop-down option which has different action Like Mark as Paid, Mark as Unpaid, Paynow. You can first select any affiliate or all the affiliate from the checkbox given in the left side and apply the following actions. Mark as Paid – If you apply this action then status “Yes” will be displayed in the Is paid column and payout date will be filled automatically. Mark as Unpaid – If you apply this action the status “No” will be displayed in the Is paid column and payout date will be filled automatically. Pay Now – If you manually want to pay the commission to your affiliate partner then you can us this action. When you apply this action then the commission amount will be automatically deducted from your PayPal account and delivered to the chosen payment option of the affiliate partner. Further, in this section, there is a drop down given to filter the affiliate list on the basis in different actions. In this section, you will get all the details of unique clicks on your website and also track by which affiliate partner you were getting the clicks. Points to remember while setting up the Affiliate system on merchant’s dashboard. Before getting started with the affiliate system, you have to set up the client portal first. You will get the affiliate sign up link only when you complete the setup of Client Portal. You have to give the client portal access to your customer if you want to give them the access of affiliate portal. If your customer has the affiliated access but did not have the access of the client portal, then the customer will not be able to get the affiliate links of your product. In the commission payment settings both the fields are mandatory. Suppose you only want to give the commission for the first payment and do not want to give the commission for recurring bills then you have to fill “0” in the Commission for Rebills field. If you do not have the PayPal account then you can give the commission from other means and mark it as paid by using the “Mark as Paid” actions. In which your affiliate partner will add your Payment option. Currently, you can only select PayPal as a payment option. From this option, your affiliate partner can get your unique URL for promoting the merchant’s product. In this section, your affiliate partner will get the details of commissions like – date and email address of the person who has purchased the merchant’s product via their unique affiliate link. 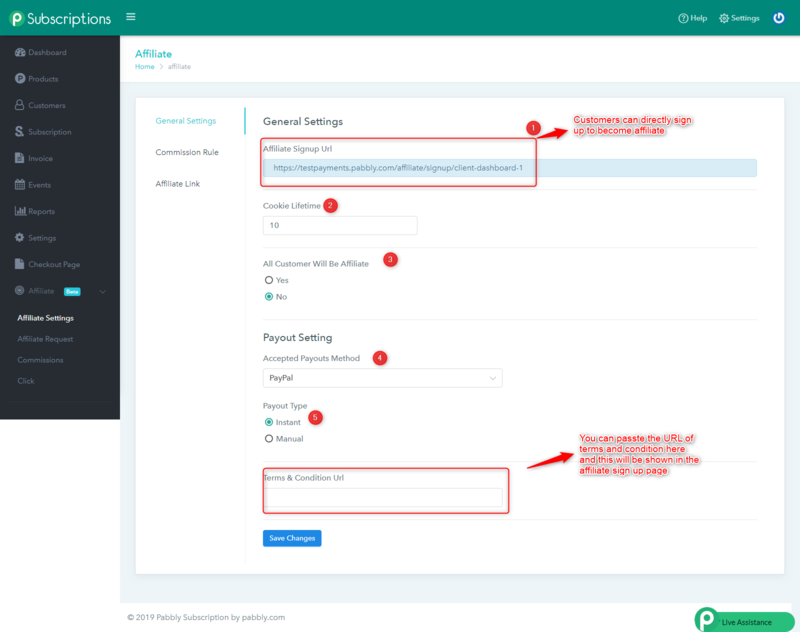 With that, the partner will get the name of product and invoice number also (In case if the partner wants to contact about affiliate commission) and the section will also show commission amount, payment status and payout date also. You will get the date, title, Ip-address, and the URL of the referred website. Suppose the merchant has a website www.xyz.com and he is selling some services by that website. This is the basic working of Pabbly Subscriptions, now to grow the business the merchant will find the option of affiliate management in the Pabbly Subscriptions account. So let’s start setting up the affiliate module. The merchant will add his website link in the target URL section. Now suppose you became the affiliate partner of that merchant and started promoting the website (www.xyz.com). You will get the affiliate dashboard by signing up from the link provided by the merchant or by sending an affiliate request to the merchant. From the affiliate dashboard, you will set up the payment method and get the unique URL of the merchant’s website for promotion. You will paste this unique URL on you promotional platforms (Blogs, Emails, Web Pages etc) and when a customer goes to the website www.xyz.com by your unique URL and purchase the product then you will get the commission according to the commission rules added for that product. Suppose you are promoting the product of any merchant. Then you will get your unique URL from the client portal or affiliate dashboard. One of your customers has opened your link and will be redirected to the merchant’s website and when the customer will complete the payment you will get your commission. But if your customer just opens the merchant’s website by your link and left the website without completing the purchase. The same customer comes back to the merchant’s website after 2 days and completes the payment (customer didn’t use your URL this time) then if the merchant has added cookie lifetime in the merchant’s account then you will get the commission in this case also. Because the cookies will be saved in the system of the end customer. Cookies are saved for the Source URL not in the destination page. Cookies will be overlapped if the URL is opened more then one time.